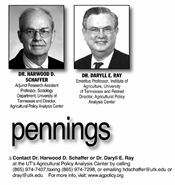 Unfettered Free Agricultural Markets: What Would That Look Like? We begin this overview of recent US agricultural policies by looking at the driving rationale, apart from ever present budgetary constraints, behind many of the policy decisions made by Congress with the support of some farm organizations and commodity groups. While the cry of many farmers and others in the runup to the passage of the 1996 Farm Bill was “Get the government out of agriculture,” that’s not quite the whole story. What agribusinesses and their supporters in Congress wanted was an end to supply management programs so there would be no repeat of the acreage reduction programs that reduced the demand for agricultural inputs in the early 1980s. To make their argument sound reasonable, they talked about ending programs, like supply management, that intervene in the marketplace. Conveniently, those same farmers, farm organizations, agribusiness lobbyists, libertarians, and pure classical economists chose to ignore non-commodity programs that have a significant impact on the market for grains, oilseeds, and fiber. Many of those programs they left in place have a significant impact on production. Without more than a century of Congressionally-funded crop research at Land Grant Colleges and Universities in every state, US farmers might not have some of the highest yields of any farmers in the world. In the absence of railroads that were developed in response to government incentives and a series of locks and dams on the Mississippi River waterway, US farmers would face significantly higher transportation costs that would reduce their competitiveness in international markets. We would be the last to argue against the many ways that US farm policy has ensured consumers with an abundant and stable supply of food. These policies have enabled US consumers to spend a smaller portion of their household income on food than almost any consumers in the world. But what we need to recognize is the economics that these policies – crop research, transportation, etc. – have put into play. What we have done is stimulate an increase in the supply of food at a rate that over time tends to exceed the growth in the demand for those foodstuffs. The result are extended periods of relatively low prices for farm commodities that are below the full cost of production – except during periods of world wars or other government-originated-multiyear-sharp expansions in demand, read due to the Russians in the early 70s and Renewal Fuel Standard in recent years. Supporters of the policies contained in the 1996 and subsequent farm bills argued against policies that were perceived to have the ability to bring supply in balance with demand. At the same time, they ignored the supply increasing impact of other policies choosing to backfill low farm income with a series of ever more expensive but inadequate farm programs.